Cooking is a rather natural use for solar power. We all know how the sun warms things that it strikes, leaving the inside of our cars hot and making us sweat on a sunny day. Many of us have also played with magnifying glasses as kids, using them to light dried leaves and scraps of paper on fire. That power can be harnessed in a more structured way, making it extremely easy to cook with. Scientists have built solar furnaces which are hot enough to melt iron. While you don’t need anything quite that hot, a simple solar cooker could be a great piece of survival equipment to add to your collection. 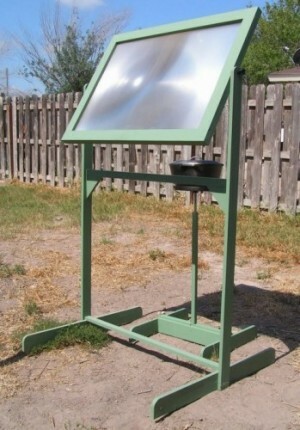 There are several different designs of solar cookers you can make, but the most effective uses a Fresnel lens. Fresnel lenses are flat plastic magnifying glasses. If you’ve ever used one of those sheet magnifiers, you’ve used a Fresnel lens. They consist of a flat plastic sheet that has concentric rings molded into the back side. The rings act in the same manner as a regular magnifying glass, with the exception that each ring is a separate thin magnifier. In order to gather and focus enough sunlight to cook with, you need a fairly large Fresnel lens. Smaller ones won’t gather enough light and using a bunch of smaller ones together really isn’t any better. It’s extremely difficult to focus the beam from several together. Basically, you need a Fresnel lens that’s about 30″x 40″. New lenses that size are hard to come by, but you can find a used one very easily on eBay. Another option is to keep your eyes open for one of the old-style big screen TVs that someone is throwing out in their trash. Those had a large Fresnel lens, just like you need, located just behind the screen. It was part of the system to magnify the image and project it onto the back of the screen. With that lens in hand, you’re halfway to making a solar cooker. The lens needs to be mounted into a frame, in order to hold it straight and steady. The easiest way to make that frame is out of two layers of 1″x 3″ wood. One layer will need to be routed slightly, to match the thickness of the lens. The lens can then be clamped between the two layers, holding it in place. To build the frame, stagger the wood, so that the corners overlap each other. That way, you don’t have to worry about mitering the corners, but can still have a sturdy frame that won’t twist. The framed lens needs to be mounted in a stand to hold it, as you’d get tired holding the lens in place while you are cooking. As you can see in the picture above, this frame doesn’t have to be complicated. The triangular pieces in the corners provide rigidity, so that the frame doesn’t collapse. The extra cross-piece at the bottom is just to make sure that the uprights stay at the same distance from each other. The feet can be made in a number of different ways, such as circles of plywood. In this case, I attached three foot long pieces of wood at a 90 degree angle to the uprights, which provides a lot of stability. The entire stand is made of 1″x 2″ lumber, with the exception of the feet, which are 1″x 3″. And the triangular stiffeners, which are made of scrap plywood. As you can see, making the stand wasn’t very expensive. It is important that the frame with the Fresnel lens in it can move inside the stand, so that the angle can be adjusted. This is easily accomplished by putting a threaded insert into the middle of both sides of the frame and using a knob with a threaded stud as a screw to attach and tighten it. 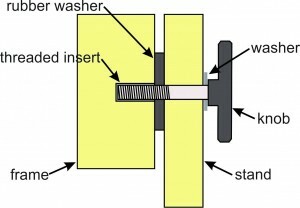 A one inch diameter rubber washer is inserted between the frame and the stand to provide some resistance, causing the framed lens to stay at the angle it is placed at. That’s basically all that’s needed to make the Fresnel solar cooker. In the photo of the cooker you also see a stand for the pot. The focal length of this type of Fresnel lens is about 24″. That means that the pot has to be placed 24″ behind the lens. To find this point, set up the lens on a sunny day and put a piece of cardboard behind it. Move the cardboard closer and farther away from the lens, until the point of light is the smallest possible. You’ll need to work quickly, otherwise the cardboard will catch on fire. The stand I made for the pot was actually a little more complicated than the lens frame and stand. It consists of a metal pot holder, mounted to a threaded rod. A nut, welded into a piece of square metal tubing allows me to adjust the height of the stand, so that I can have my cast-iron pot right at the focal point. What made this more complicated was finding the matching square nut and threaded rod. Then, I had to bend a metal circle out of 1″ strap steel and weld it to an X of square steel tubing. There is also a square nut welded to the bottom of this, completing the “burner” for the pot to sit on. 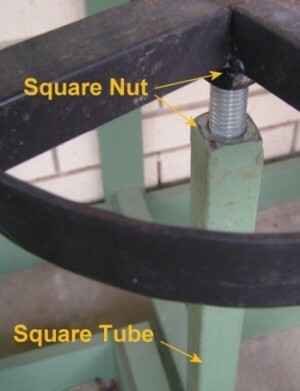 A second square nut was welded to the end of a piece of square tubing, which is captured into a wooden base with feet to make it steady. 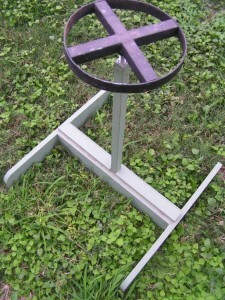 The height of the pot can be easily adjusted by threading the rod into and out of the lower part of the stand. The threaded rod is 2 feet in length, giving me a fair about of adjustment. Cooking with this cooker is fairly fast and easy. I’ve fried eggs on it, putting a pan on top of the “burner.” Last time I tried that, it took about two and a half minutes to make scrambled eggs. For more complicated recipes, I use a cast-iron dutch oven, making soups and stews. The one problem with any solar cooker is that you have to readjust the position of the lens every 15 minutes or so, as the sun tracks across the sky, or it will move off the pot. If you are cooking something that takes time, such as a pot of stew, this could mean a number of adjustments. However, you will have spent nothing on the energy used to cook that food. I was reading the solar cooking article when this add came up about energy break through it would have been fine except THE WHOLE DAMN PAGE STARTEDTO MOVE and the only way to make it stop WAS TO CLICK ON THEIR ADD VERY ANNOYING.THINKING OF DELATING THE THE WHOLE SITE NOW.